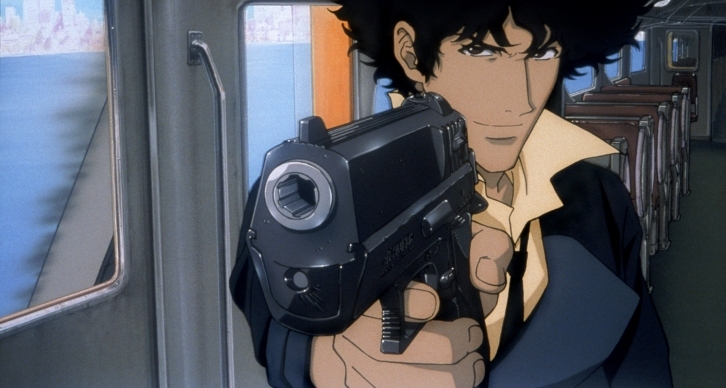 Set in a universe that is partly inspired by 1970s blaxploitation, and partly inspired by Bruce Lee movies, Cowboy Bebop: The Movie takes place in a future solar system crisscrossed by teleporter freeways. Its look is deliberately designed to recall the pulpy quick-fixes of hack science fiction, with rockets stuck on big-rig trucks, and religious cults stuck in orbit to give them a sci-fi tweak. Cowboy Bebop’s fortunes as a movie seem to have been cursed by the devil himself. At some point during production, the producers were looking at a perfectly reasonable 90-minute movie, which some bright spark decided could be “improved” with the addition of 30 gratuitous minutes of filler. When finally released, it was slated to hit American cinemas slap-bang in the middle of hysteria about 9-11. Its concentration on the motives of a terrorist turned into a sudden spell of cold feet on the part of its distributors, and it was consigned to the movie sin-bin for a while, along with Rintaro’s Metropolis, which featured a disturbingly familiar sight of a large building crumbling into dust. And when it first hit the UK with a 15-week run at the prestigious ICA cinema on Pall Mall in 2003, its coughing, plague-ridden characters evoked unpleasant reminders of SARS, a different kind of terror then threatening the Far East. The film takes place towards the end of the TV series continuity, between episodes 22 and 23, shortly before a landmark chapter in which the crew of the Bebop freighter are split up once and for all. For fans of the series, it is thus a last chance to see their heroes before events broke up the old team, and for anyone who has already enjoyed the TV version, it contains plenty of goodbye tips of the hat. For other viewers, it still has the unmistakeable fun quality of a sci-fi bounty hunt, but those who come to it without the experience of the original may often wonder why it is that this rag-tag team of misfits bother to stay in each other’s company. The moments of character and history that define them are all safely tucked away in the 13-hour TV series. While it features great music from the peerless Yoko Kanno, and superb Moroccan location work (yes, even in animation form), Cowboy Bebop: The Movie risks remaining a mystery to many of its viewers. But if it encourages fans to go out in search of the original series, then it will have achieved something. This is one anime title that is well worth hunting down. Jonathan Clements is the author of Anime: A History. Cowboy Bebop the Movie is released in the UK by Manga Entertainment. It will also be included in the forthcoming Anime Limited complete box set.